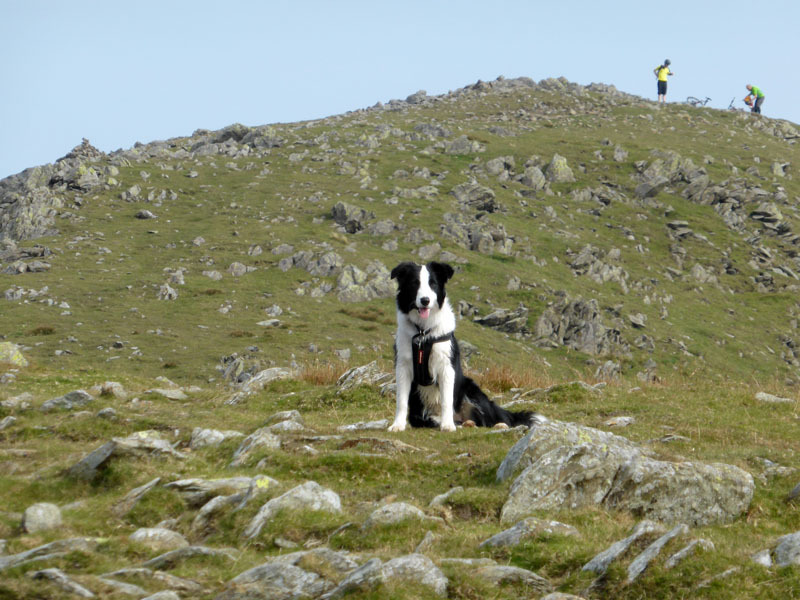 Today's walk was another training exercise for Gary and Aimee as they prepare for the 3YP in a couple of weeks time. We needed a good length walk with plenty of ups and downs and the following seemed like a good idea. 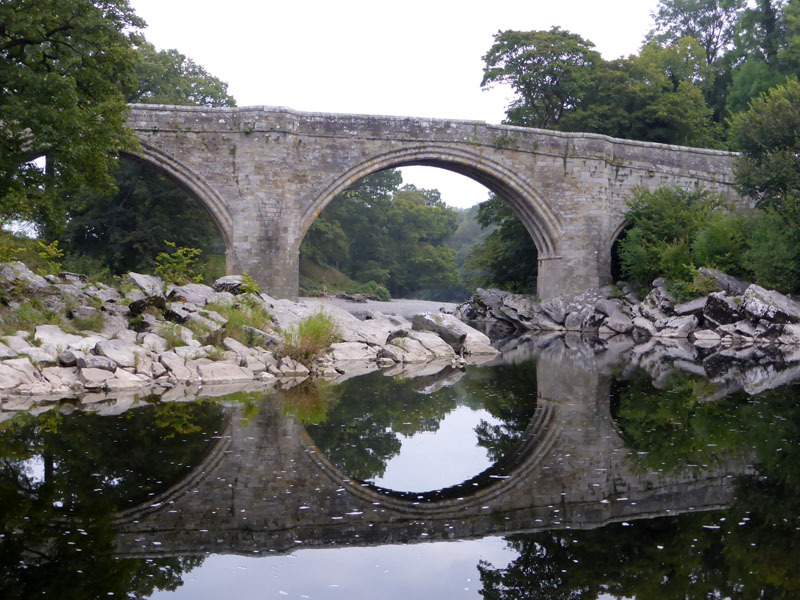 Me n' Molly had a leg stretch at Kirkby Lonsdale (left) on the way up and the adventure started in Coniston village at 09:30hrs. 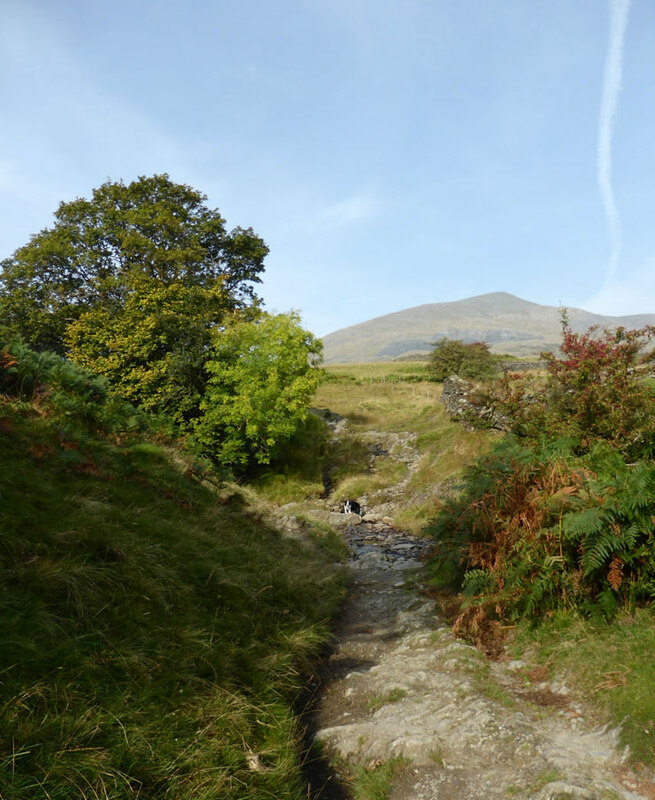 Walking south out of Coniston to reach Bowmanstead and The Ship Inn, we then took a path behind the pub and over the disused railway line to take a gently climbing route that would reach the Walna Scar Road under Nettle Crag (of Coniston Old Man). 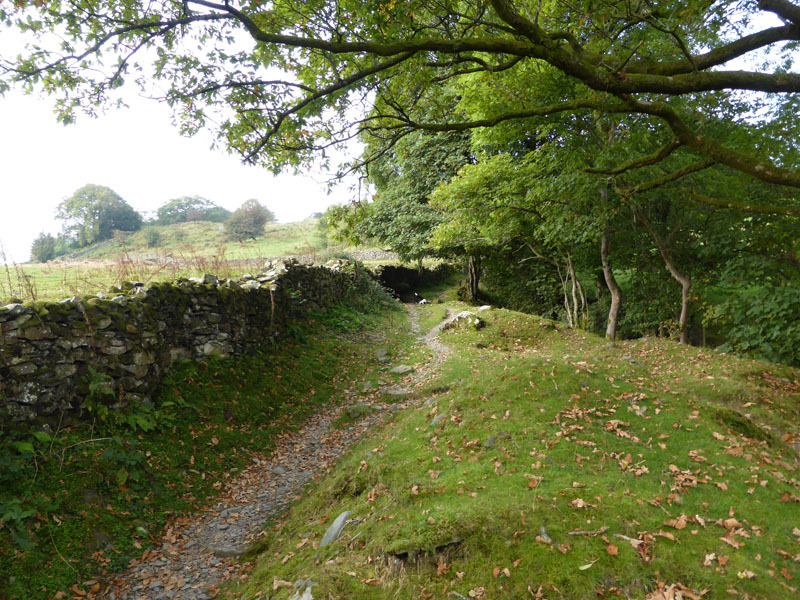 A sometimes feint path meanders across marshy Banishead before turning right to join the Walna Scar Road. One of the iconic views of / from the Walna Scar Road. 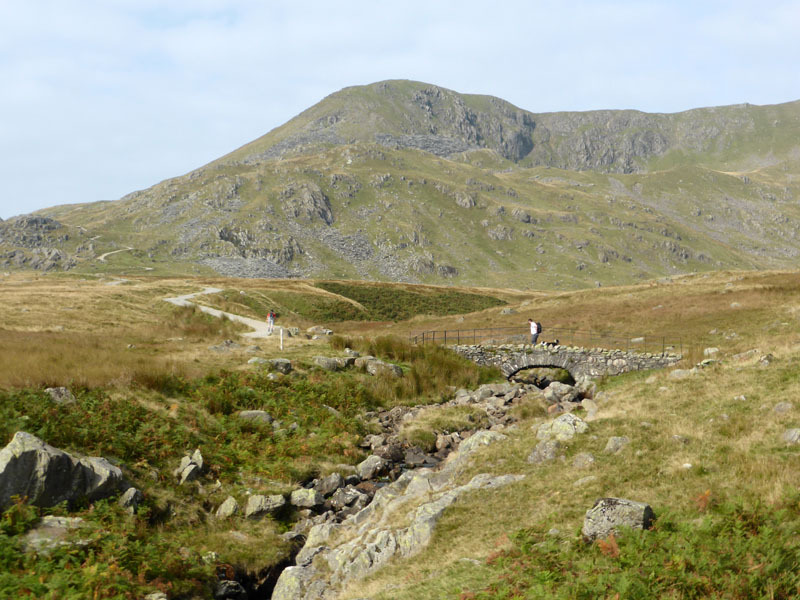 Brown Pike is the first peak on the way up to Dow Crag, Molly has raced ahead to join another walker on Cove Bridge. 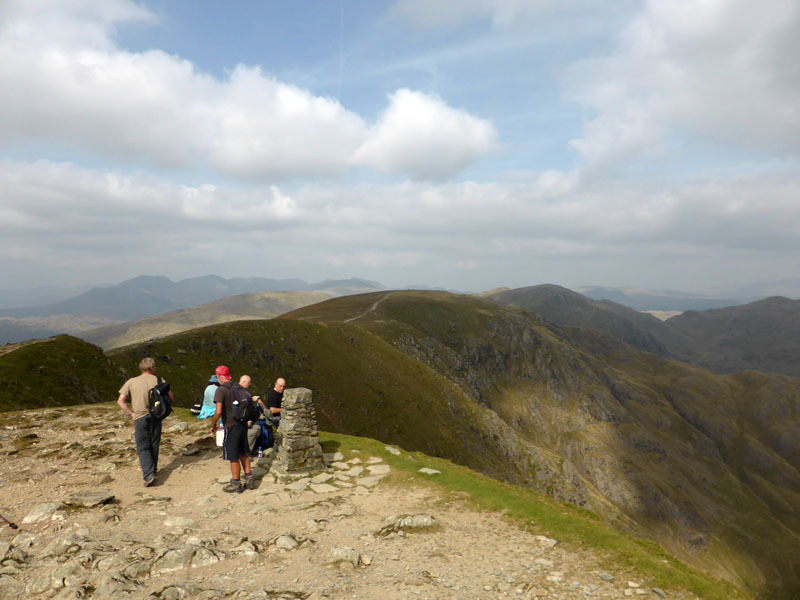 The top of Brown Pike. 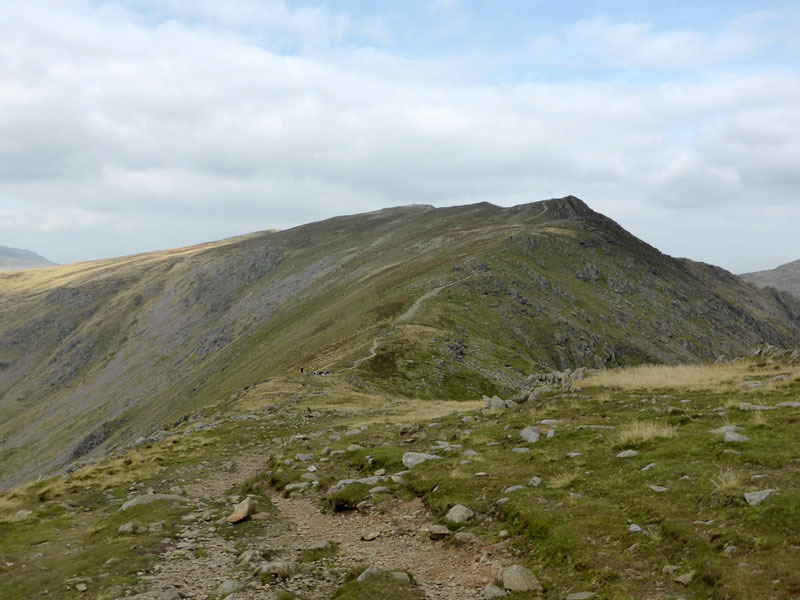 Easy walking now to the summit of Dow Crag, Buck Pike is next up. 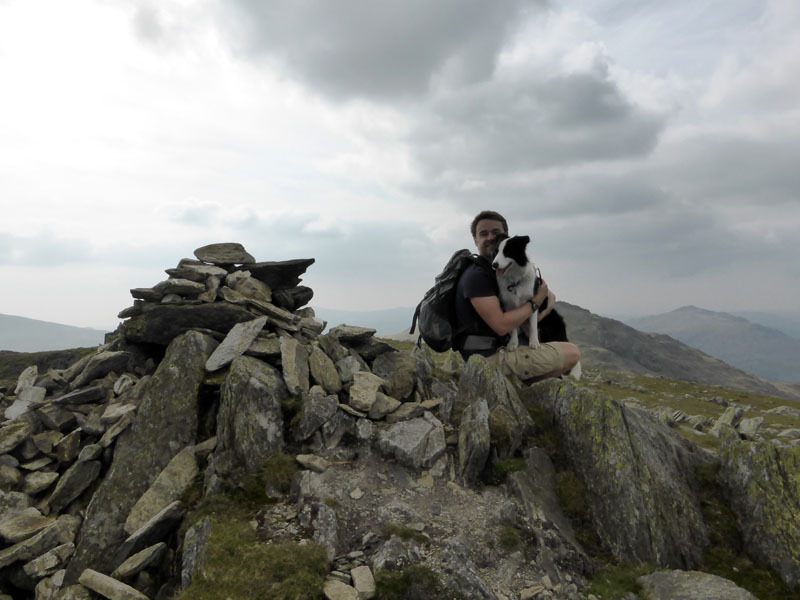 Aimee's first Lakeland fell top, Gary's climbed quite a few of the headliners in his younger days. 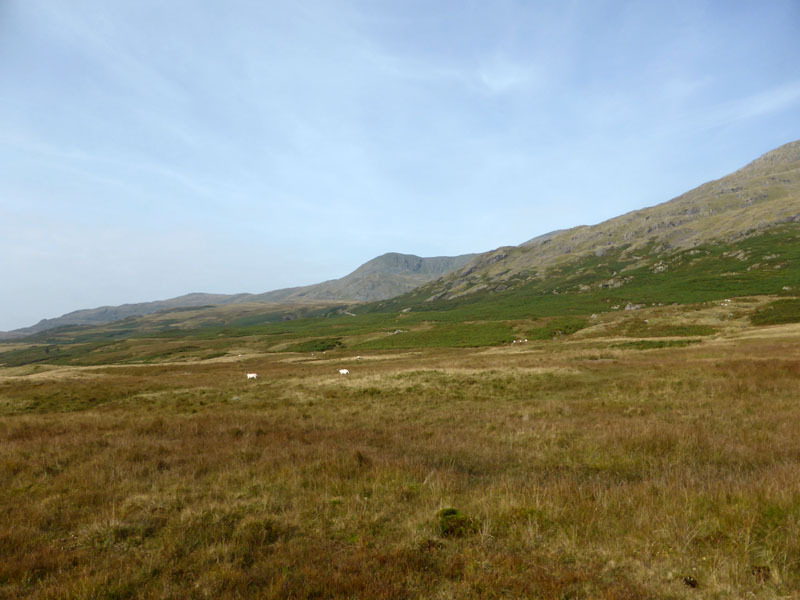 The plan was to follow the track around to Coniston Old Man (1) and then walk along the ridge, over Brim Fell and Swirl How, to reach Great Carrs (2) in the middle distance. 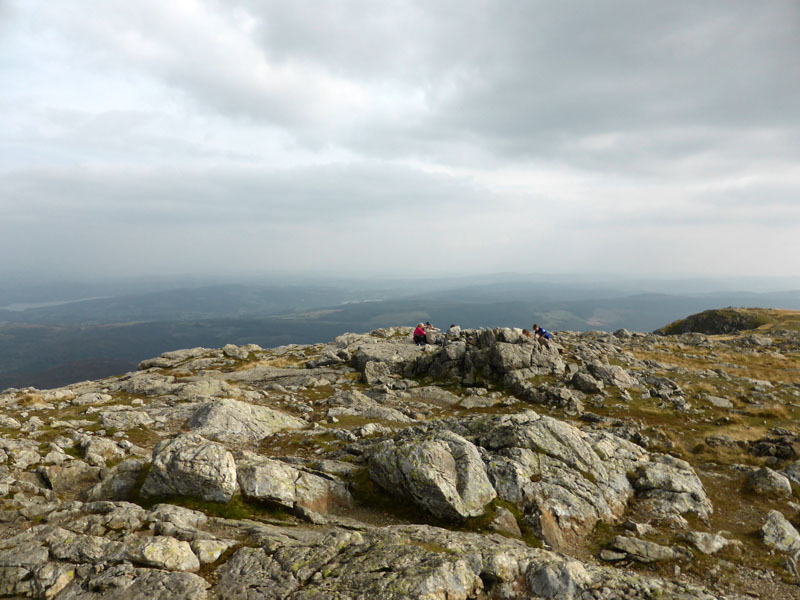 We took lunch at one of my favourite seats, just on the far side of the col. Seating for five and good views down to Goat's Water. 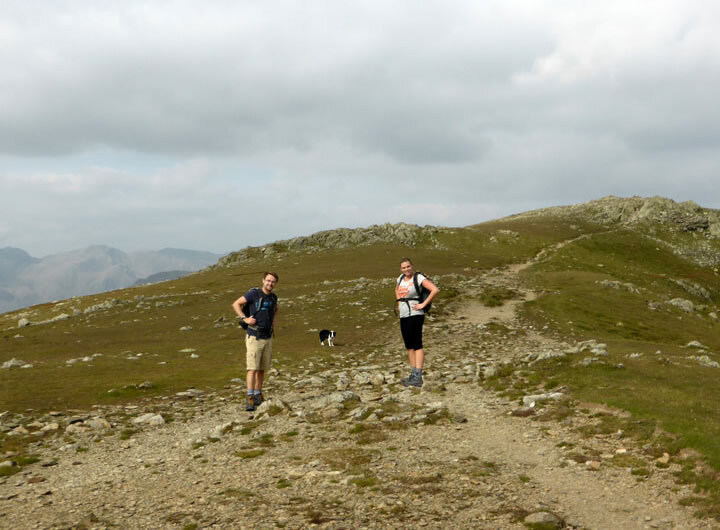 As usual, there was yet another organised run taking place on the fells, so the vicinity of the Old Man summit was even busier than we might have expected. I'm stood on the highest point, the man-made "crown" and popular spot for sandwich eaters. 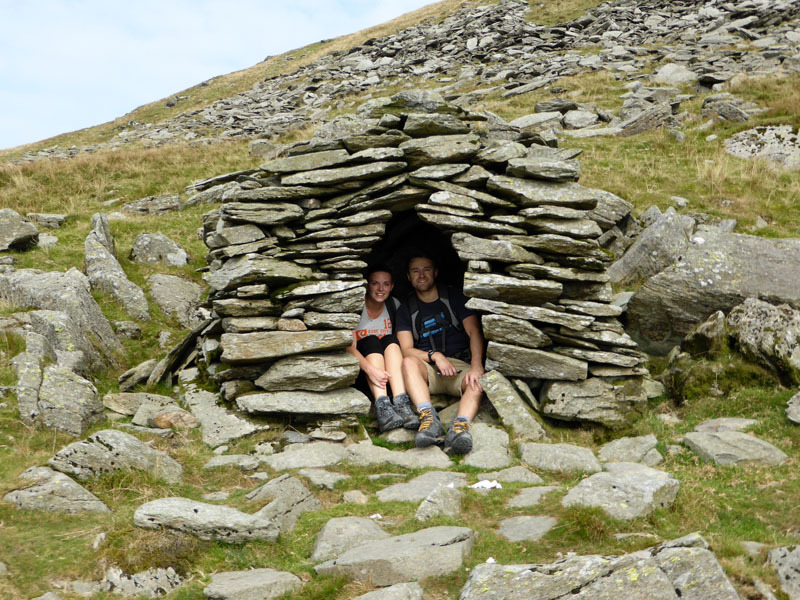 The clutter on view at the trig point includes a couple sat on foldaway stools, whatever next? The look back to where we were reveals the drama of the crags. 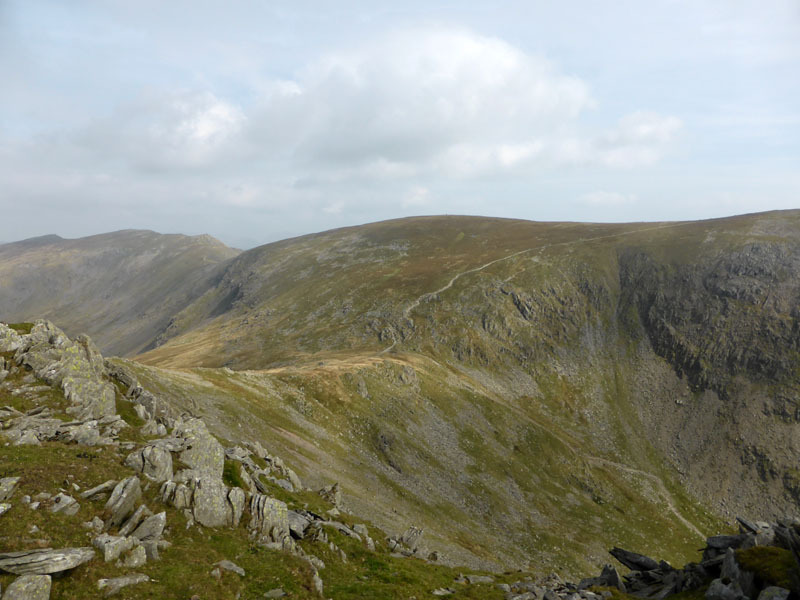 The gully on the left is known as the "South Rake" and is scramblable (if that's a word), but the rest of the rockscape is out of bounds to walkers. 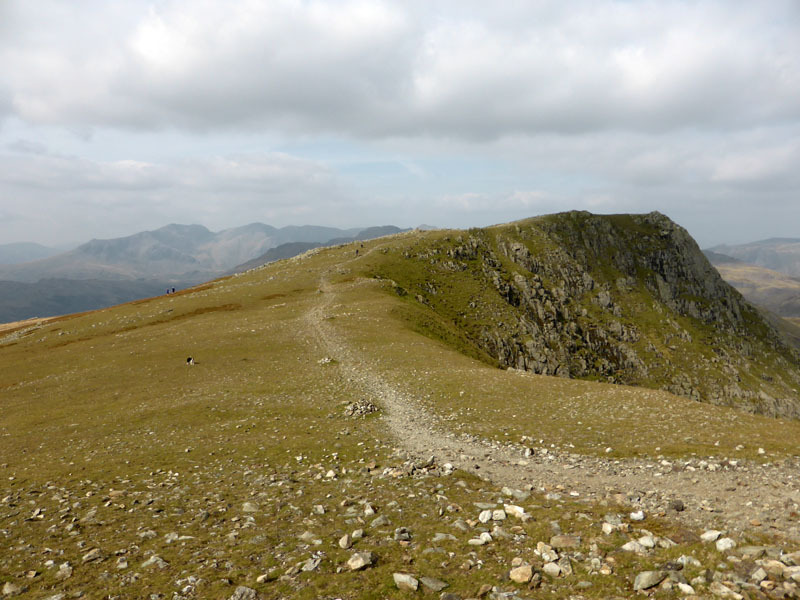 We walked off to the summit of Brim Fell and then along the ridge to Great How Crags and off to Swirl How. 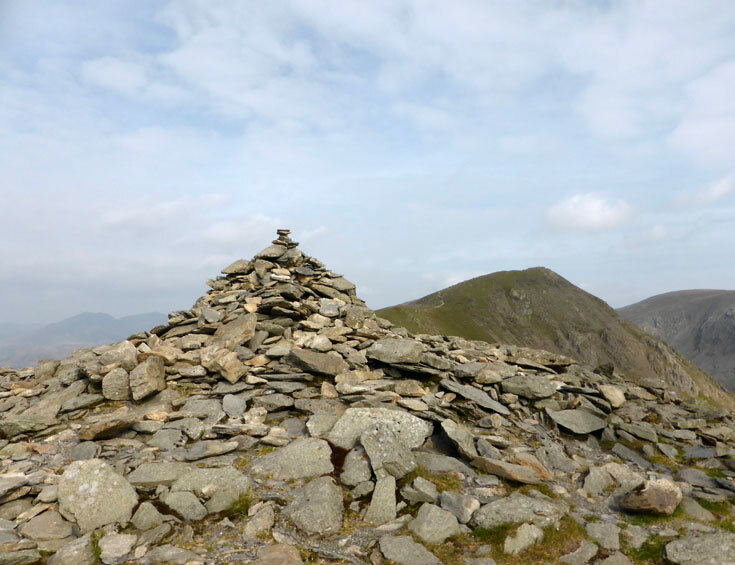 Brim Fell is one of those that some fellbaggers tick off with minimum effort; come back another day and do the job properly with an ascent from Coppermines Valley and Levers Water. 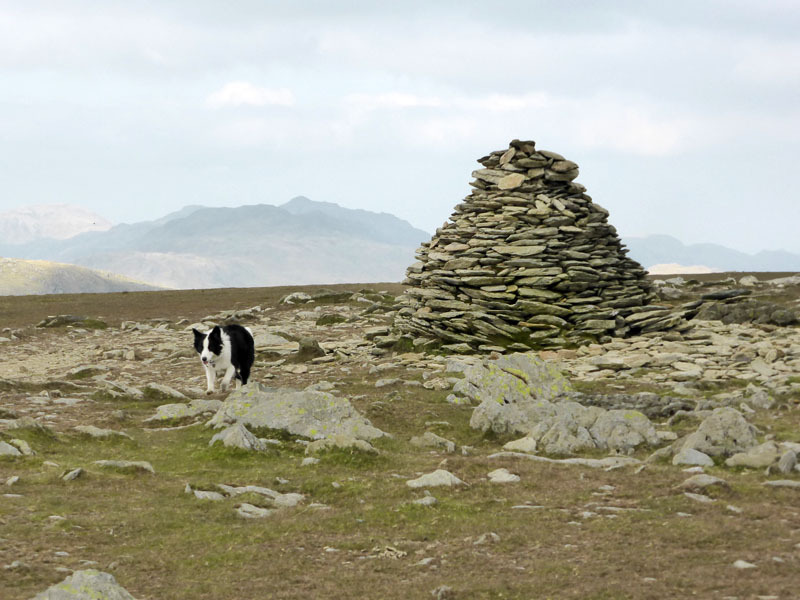 Almost a perfect day for fellwalking: just the right temperature, no wind, no threat of rain, good visibility, dry under foot. 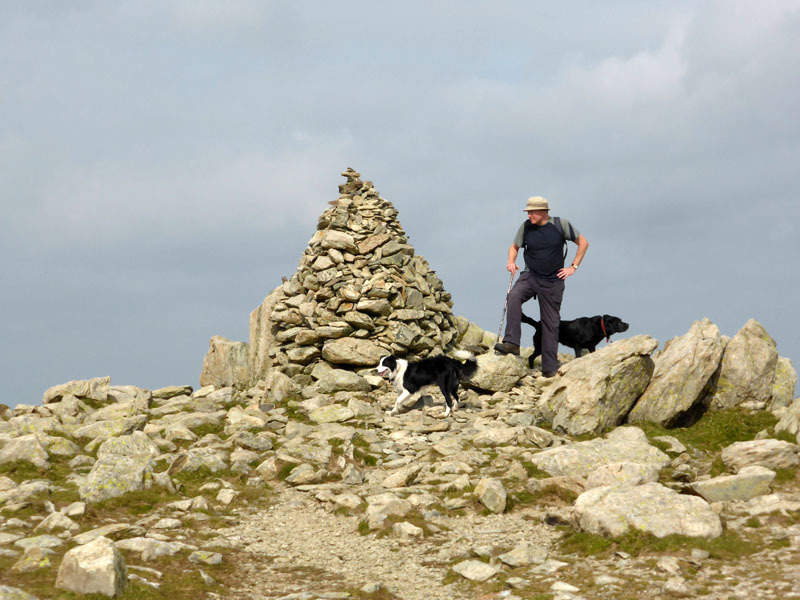 Molly joins the summit cairn admirer and his dog. 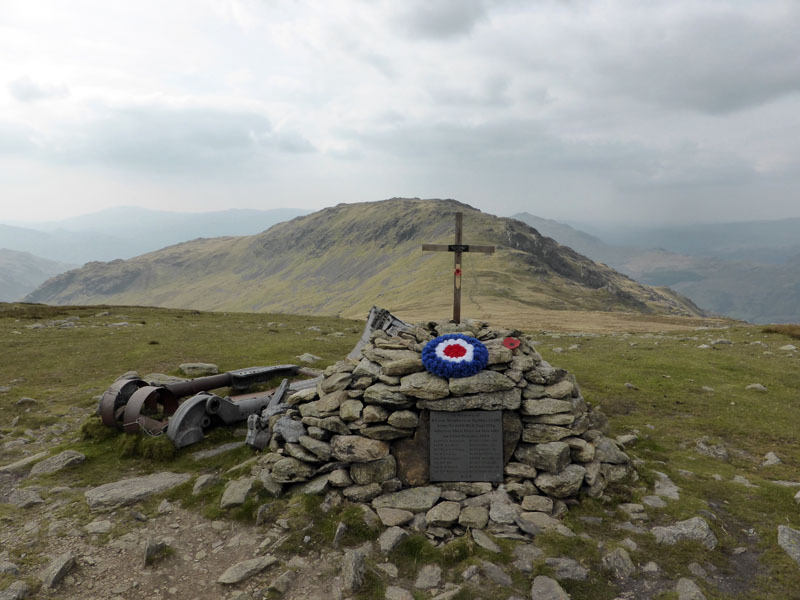 The memorial to the Canadian crew of the Halifax Bomber which crashed up here in 1944. Back to Swirl How and then down Prison Band for our final ascent of the day: Wetherlam. The Lakeland Fells are blessed with fine names and The Prison is an area to our right, with Prison Crag and here Prison Band. 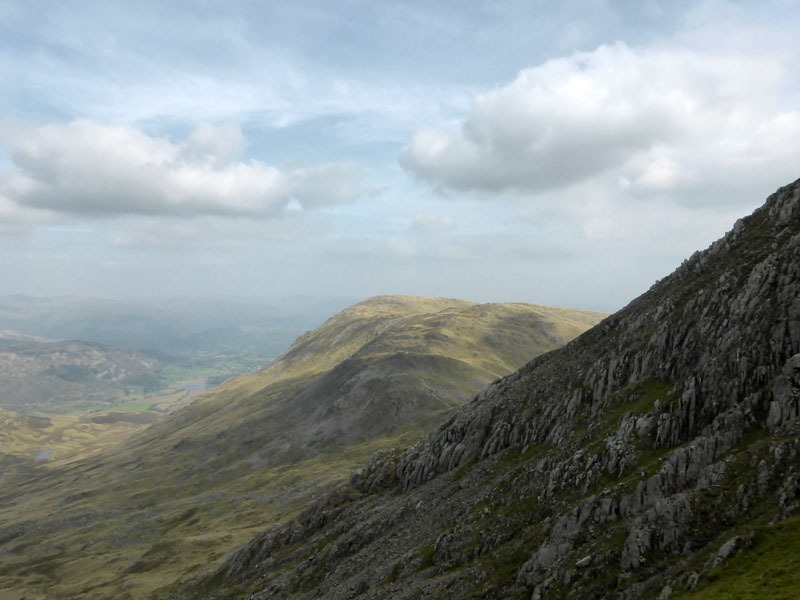 Wetherlam is straight ahead. The newcomer, Aimee, had no hesitation in confirming that she wanted to continue with the last fell, good stuff! 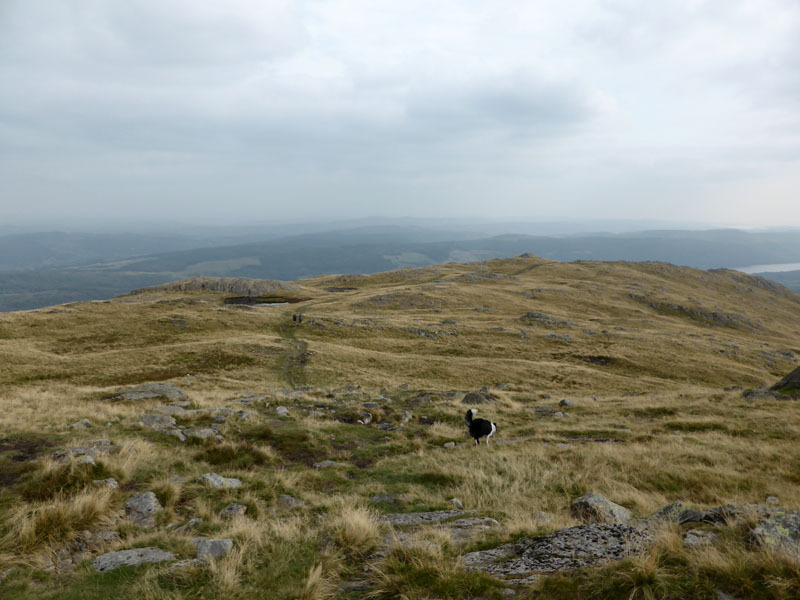 It doesn't seem long since I was last up here with Molly, four weeks ago in fact. 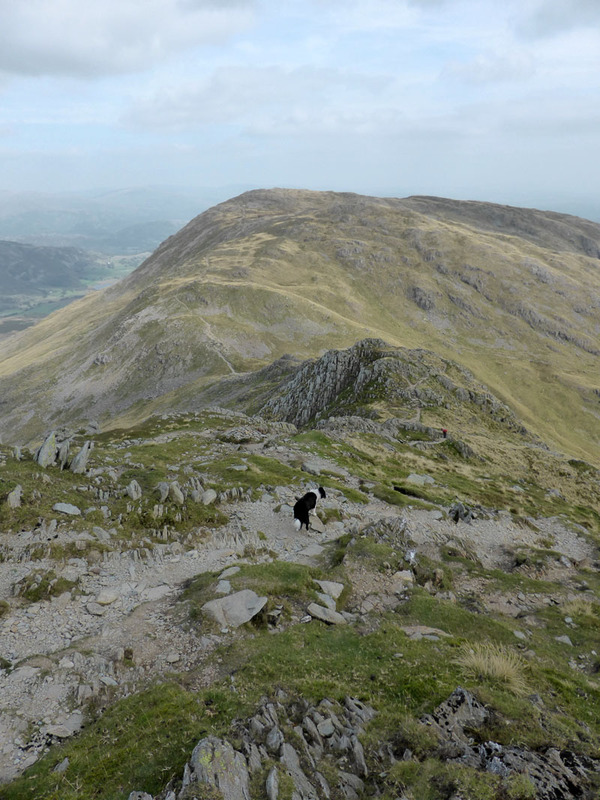 I met a chap up here studying his revised edition of Wainwright's Southern Fells. I am confused by the appeal of the revised editions; by all means buy the latest OS Map - it's scientific and needs to be accurate. 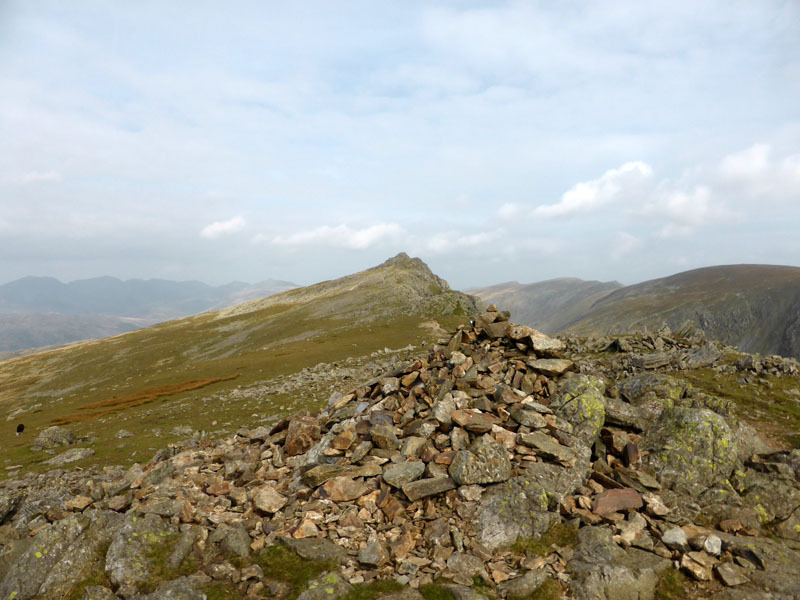 Wainwright's books are his interpretation of the fells and comprise a work of art. You wouldn't paint a Massey Ferguson into the "The Hay Wain", so why accept revisions of AW's work? That'll upset some folk, get in touch, what's your opinion? 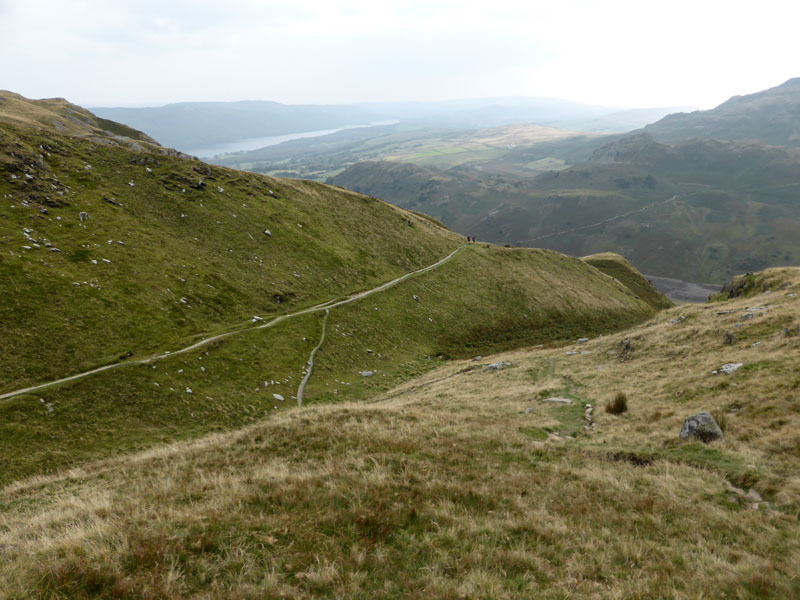 Our descent route was to the south and past a small tarn at Red Gill Head, before finding Hole Rake for a way down to the miners road to Coniston. 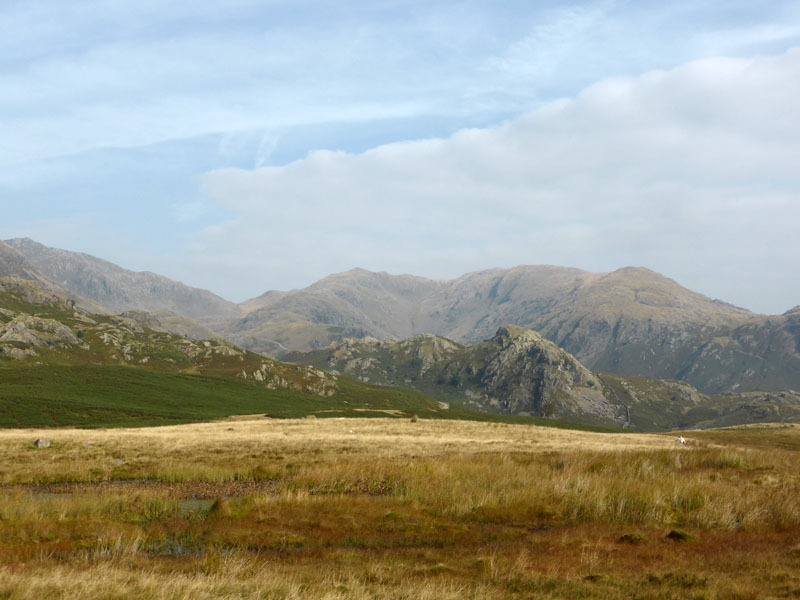 We pass Rascal How and Mouldry Bank on our way down Church Beck - more fine Lakeland names. 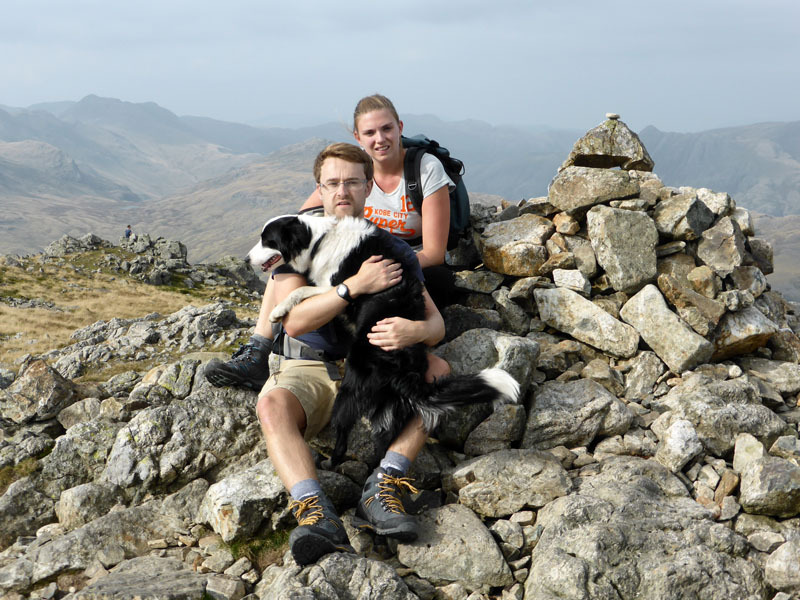 Walkers: Me and Molly the Dog with Gary & Aimee. Time taken: 7hrs 30mins hours over a distance of about 13 miles. 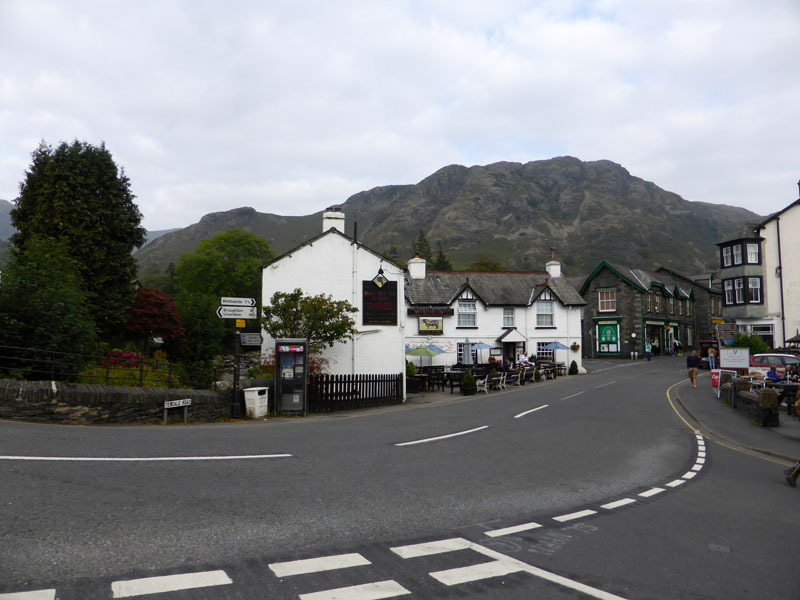 Route: Coniston roadside parking, Bowmanstead, Banishead, Walna Scar Road, Brown Pike, Buck Pike, Dow Crag, Goat's Hawse, Coniston Old Man, Brim Fell, Swirl How, Great Carrs, Swirl How, Prison Band, Wetherlam, south to Hole Rake and along the miners' road back to Coniston. Weather: Calm, shirt-sleeves, variable amounts of cloud - just right. 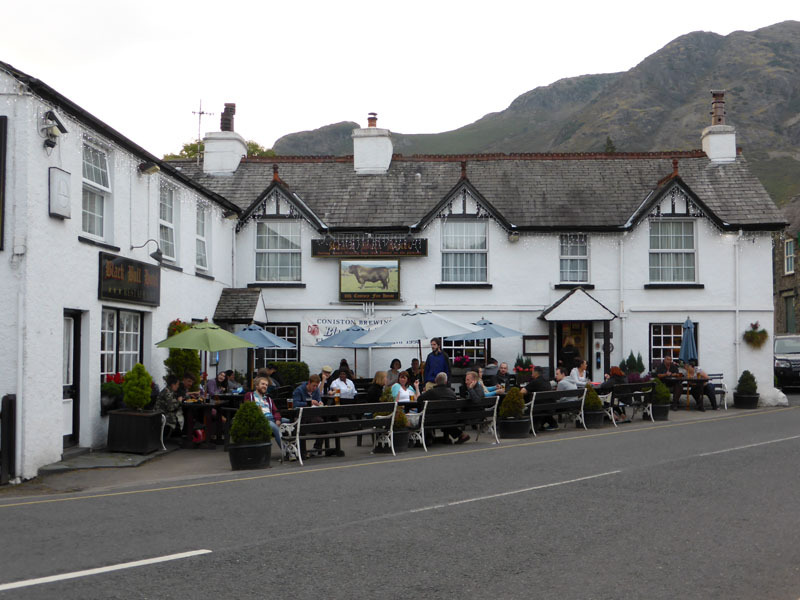 Refreshments: Good pub food The Black Bull, Coniston. 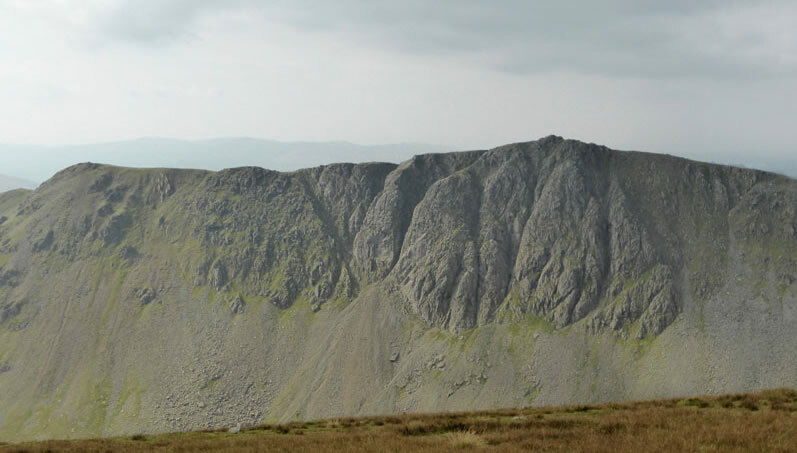 * refer to Wainwright's Southern Fells - Dow Crag. 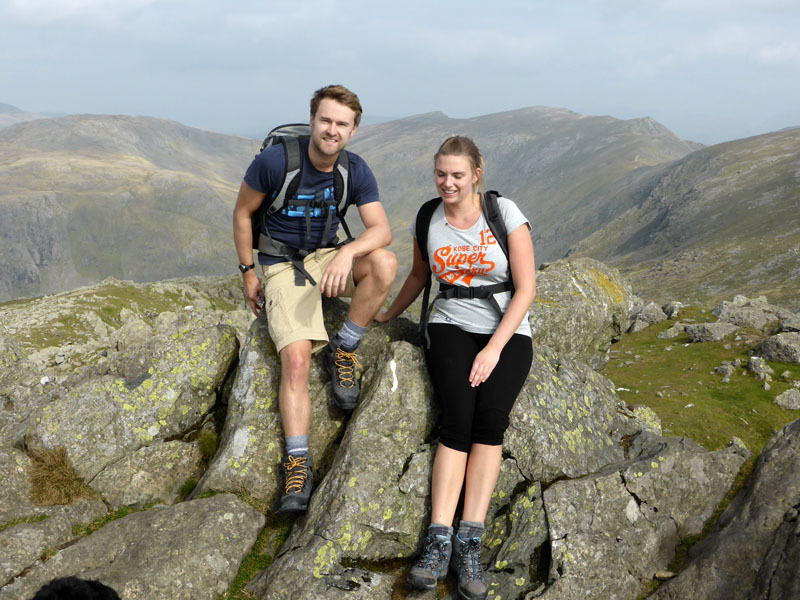 Gary & Aimee's Just Giving site for the Three Peaks walk in aid of McMillan Cancer Support - Great Cause! 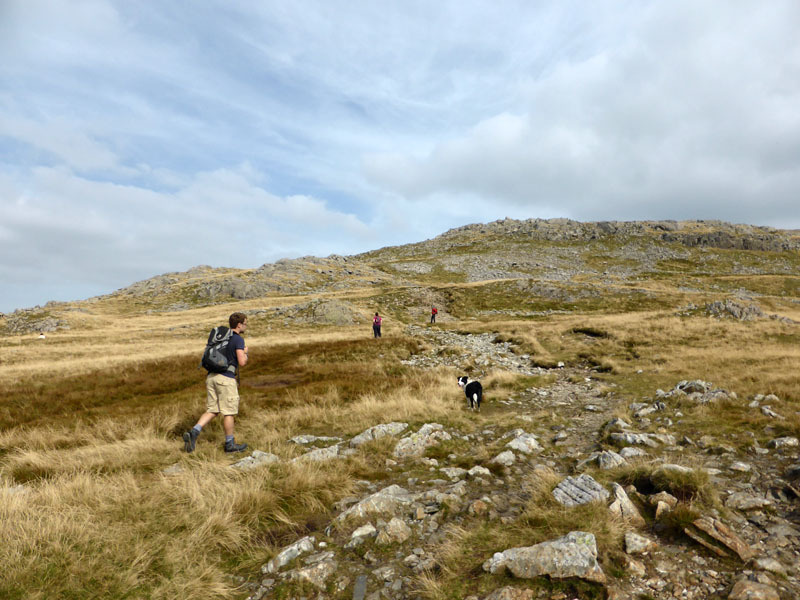 Wetherlam to Coniston Old Man on a different day.